One of the key application areas for JMP is consumer and market research. As I was invited to give a presentation on JMP for marketing analytics, I was curious about how complete the capabilities of JMP are. I wondered whether there are any significant gaps. At a recent American Marketing Association conference I discovered a popular textbook titled Modern Marketing Research: Concepts, Method and Cases. The book is written by three marketing professors at the Ross School of Business, University of Michigan and has been used by many top business programs. So, the book is suitable as a benchmark reference for my gap analysis that compares what’s being taught at leading MBA programs and what’s available in JMP. The textbook is divided into three parts. The first two parts discuss the principles of marketing research, as well as survey designs, sampling and data collection. Part 3 covers the analytical and statistical approaches for the data analysis, which is my focus of the gap analysis. I found essentially no gaps. The textbook covers a comprehensive set of traditional statistical methods used in marketing and consumer research such as descriptive statistics, hypothesis testing, multiple regression and multivariate methods. It then goes on to discuss choice models (aka conjoint analysis) and multidimensional scaling, and it ends with a chapter introducing several emerging analytical techniques and concepts like heterogeneity, hierarchical models, etc. JMP users perhaps know the Distribution, Fit Y by X, Fit Model and Multivariate Methods platforms well, but might be less familiar with the random coefficient models in JMP Pro through Mixed Model personality (please check out my JMP Pro for Linear Mixed Models blog posts). You can use random coefficient models and nesting random coefficients to model “slope heterogeneity” and multi-level structures as discussed in the book’s chapter 12. For choice models, JMP provides both modeling and design of marketing experiments involving product features and consumer attributes. My colleague Melinda Thielbar has written about the latest development in the Choice Model platform. I used the Dial Readout Scales case study from the textbook, and JMP not only produces the part worth estimates and likelihood ratio tests, but creates the interactive probability and multiple choice profilers that enable you to visualize the consumer preferences for alternative new products. 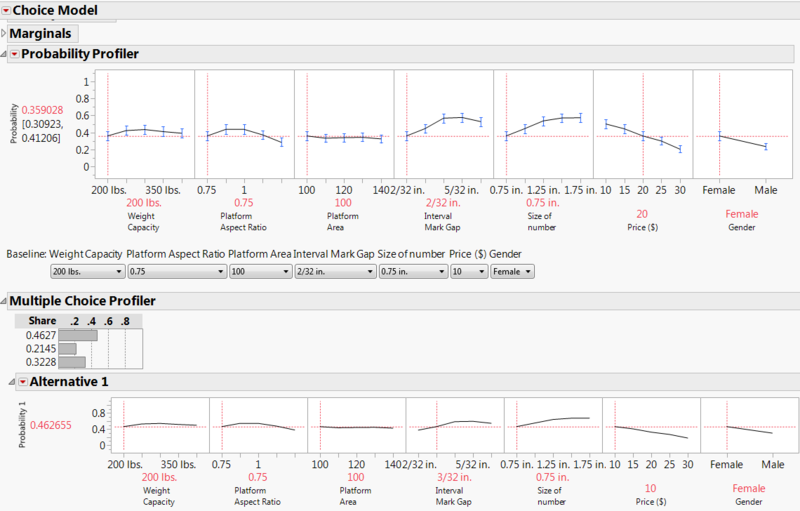 Probability and Multiple Choice Profilers enable you to visualize how competing products compare. As for the multidimensional scaling, another colleague of mine, Kelci Miclaus, has created a JMP add-in that performs the analysis through SAS or R integration. What’s more, JMP Pro has other advanced analytical methods such as uplift models and data mining that are useful to marketing analysts and consumer researchers. For those of you who would like to play with the data and cases from the textbook in JMP, I have created a JMP add-in that collects all of the data as JMP tables. I am reaching out to ask a question from your Factor Analysis On-demand webinar. I am following it using my own dataset. I have mapped certain products and identified their preference ranking based on the order of appearance on the preference vector. The other attributes (vectors) are also on the map. I then took the rotated components (factors 1 and 2) and use them as inputs to my Preference model (y=preference). Can I use this model to identify attributes that I need to focus on in order to "improve" my product ranking? Yes you can run a regression on product preference ranking with the rotated components (i.e,, factors) as explanatory variables.